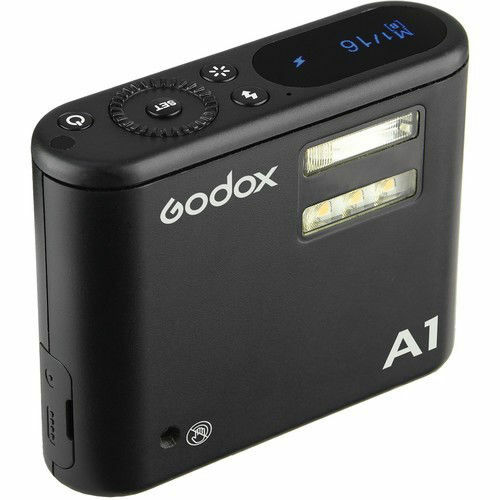 Shine a light while you shoot with the Godox A1 Wireless Flash for Smartphones. This compact flash unit is compatible with iOS and can be used to illuminate smartphone photos or to wirelessly synchronize professional flash units using a smartphone with the free GodoxPhoto app. It features five power settings, from 1/1 to 1/16, enabling you to use up to 8W of power and produce an approximately 6000K flash. The A1 operates on both the 2.4 GHz and 433 MHz wireless frequencies, with a variety of channels available for both master and slave functionality. Its 1000mAh battery recharges via the included USB Type-C cable and can produce up to 700 full-power flashes on a charge with a 2.5-second recycle time. As social networking development and smartphones become more popular, phone shooting is used more and more in peoples' daily lives. However, smartphones cannot sync with professional flashes. To solve this problem, Godox has designed a product that lets smartphones sync with professional flashes - the Godox A1. Enable your smartphone to have its own professional flash. Shoot with one flash, multiple flashes, use the Godox X system to sync your phone with professional flashes, use your phone to adjust parameters of Godox photo equipment (flashes and LED lights), and use it as a camera hot shoe trigger via A1's specialized accessories. iPhone users can download and install the app by searching "GodoxPhoto" in the App Store.